Sneakpeak: Turn-of-the-Century Styled Shoot — Wilder Events Co.
Inspiration: We love working with real couples; their genuine love, goofiness, and comfortability makes the shoot feel authentic. Sometimes we forget they're not actually getting married in that moment... The inspiration for this shoot came from the couple themselves. Prior to designing and coordinating, we asked the couple a set of questions from, "What are three things you cannot live without?" to "What did you first notice about your significant other?". You'll notice in our shoot, we had a set where Alex ("Groom") was serenading Rebekah ("Bride") with his guitar, and that was because his guitar was one thing he said he couldn't live without! We wanted something non-traditional (as seen by the scythe and black dress, to name a few) that would reflect their personalities, style, and uniqueness of selves. Actually, a lot of the props came from the couple's own home. You can see why we'd forget we weren't at a real elopement! Our original notes for this shoot were: old western, turn-of-the-century, late 1800s/early 1900s, frontier-esque. And let me tell you, it took a couple hours perusing the web and Pinterest to finally get a feel for what we were really going for. Setting: Sami, one of Wilder's co-founders, scouted out locations twice prior to the shoot. Our couple wanted dry, grassy, California rolling hills, which sadly is hard to find without the obstruction of housing and development near the Bay Area. We settled on this beautiful, golden open space at the base of Mount Diablo just off the road, where service gets crackly and surroundings a bit quieter. Oak trees and cows scattered the hillside and (we'll never forget) tarantulas tromped the pasture floors. S: We found this incredible tree that honestly looked like it was on the end of its life cycle but knew we had to hang our vendor's planters in this old tree (it was just perfect for what we wanted!). So we boosted Ellie up on the tree so she could reach and hang the planters. Realizing that our photographer and models were back up the hill, we walked to go get them, leaving Ellie stuck up in the tree with no way of getting down... (oops). Some may say it was an accident, some may say it was on purpose, but that's a secret we'll never tell. E: We worked with this incredible videographer, Scott Allison Films, and in the second half of the shoot we got to watch him work his magic, and it really got exciting when he started flying his drone! I can confidently say, the three of us (and most of the other vendors) were mesmerized. You would think we'd never seen one before... He got beautiful shots of the shoot site and surrounding hills. You can find his video on our home page! Archway: We build all of our archways for our shoots. This time we went for a wooden triangle archway, that actually ended up breaking as our florist was designing. That's one thing you never see in the photos; all of the little things that go wrong that need last minute fixes as we try not to freak out. We ended up just wrapping heavy wire over and over around the split wood and prayed it would stay together by the end of the shoot. 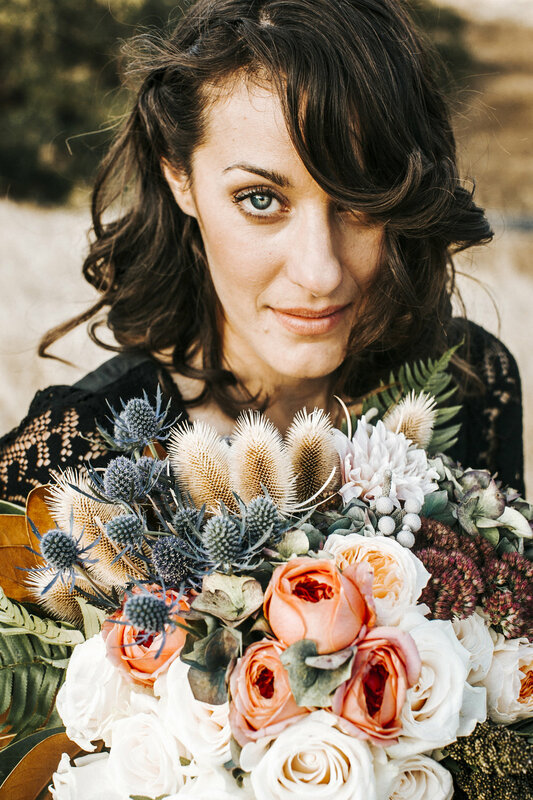 Our florist, who also happened to be the model, ended up doing such an amazing job! The archway featured eucalyptus greenery, berries, a real bovine spine (like whaaaa! ), and vintage lanterns, all of which she owned beforehand. She then lined the archway with wooden boxes, flowers, feathers, skulls, and more vintage lanterns. The amount of creativity we see from our vendors is just mind-blowing. Style & Apparel: Rebekah wore red cowboy boots and her grandma's vintage dress, fastening a couple of safety pins here and there to make it more of her style, and Alex featured a beautiful silver bolo tie, bright red frayed vest, and best of all, his burly beard! We could write all we want, but pictures say 1,000 words. See a full list of vendors involved with the shoot here. 1) How do you find all of your vendors? There are three main ways we find our vendors: Word of mouth/ friends-of-friends, Instagram (it's seriously such a wonderful platform for the wedding industry! ), and spending hours on the Internet. It's a lot of searching, a lot of emails (many of which don't receive responses), and a lot more searching. But at the end of the day, we always find the perfect vendors for that specific shoot. 2) Is there any monetary exchange? What are you getting out of them? Nope, no monetary exchange. Styled shoots are a collaboration of talents. Our styled shoots are in exchange for visual content, given by the photographer, and the chance to meet and work with others in the industry. It has helped us gain an incredible amount of insight and experience working with actual couples, other industry members, and designing and coordinating events. We've actually realized we LOVE designing, styling, and coordinating styled shoots, and would definitely like to continue doing so with other vendors, companies, and couples in the future. 3) How far in advance do you plan your shoots? It depends on the shoot, what we have going on in our lives, and how many upcoming shoots we have. We just wrapped up a shoot in Southern California at the end of August and right when that finished we started planning this shoot. So, it ended up being about 4 weeks of ferociously planning before the big day! Although, we're currently working on one that is 2 months out, so it all depends!